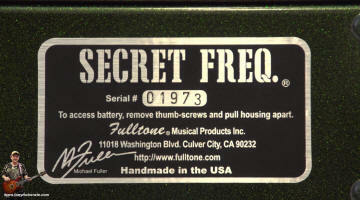 Fulltone's Secret Freq offers something special... but does this pedal reach where others have failed? and is it actually worth buying? Fulltone have been around for years... opened by a guy called Mike Fuller (hence Fulltone) who was they say a guitarist himself. Thats all pretty good news really... because its likely that he will at least have some idea about tones from guitar - you know, the stuff that matters. Hopefully he employed (ow was) a great engineer to turn his ideas in to decent gear. And it looks like his plan worked out just fine. The company is based in southern California (where else?) and makes and chorns out some of the most robust and great sounding pedals around these days... which is far more than what could be said for some of the other stuff out there. Pedals for drive, distortion, delay, chorus, univibe,wah you name it there's a pedal out there to do it. But often these days there is a real mishmash between great sounds, great quality or indeed great price. The pedal market is a real mess where there is no such thing as a 'standard' (no matter what anyone says) and it's a free for all with the Chinese coming along in a big way. Indeed even many 'USA' manufacturers are moving their assembly to China and other far eastern places. Above is a shot of the secret freq pedal that I bought from guitar center earlier in the year. It had a list price in the UK of £129 and in the USA $159 or thereabouts but if I remember correctly I paid about $80 as a second hand unit. As you will see this unit has a pretty strong case and does not bend easily which is nice. When assembled you can throw it around if you want and it won't feel the bumps. 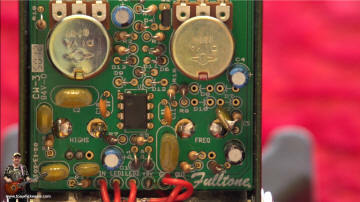 Taking a closer look immediately makes me 'crack up' (no not that sort of crack) when I see that Fulltone in their ultimate wisdom have 'gone to the trouble' of defacing the little 8 pin chip that is at the heart of the secret freq effects pedal so that 'no one' could replicate their pedal. Now that's basically like saying that it won't go dark tonight because with or without the numbers you CAN work out what that chip is... so much for bothering to remove the numbers in the first place. But I understand why they do it, it's another 'layer' to stop unscrupulous guys from blatantly copying their circuit or pedal. 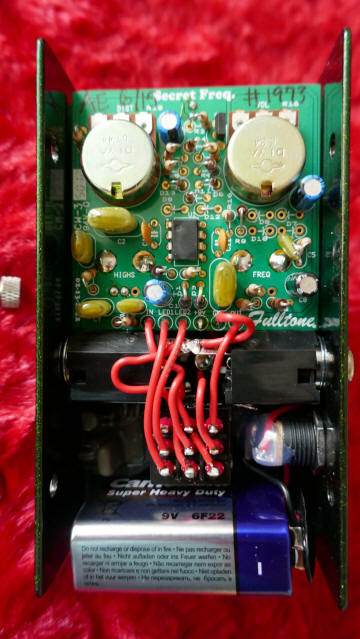 Let's face it, theres enough counterfeit stuff going on without Fulltone being copied again as indeed the OCD pedal has multiple times. The circuitry to be honest tells me little and I'm not going to sit around analysing 8 pin chips any time soon, but the reason to see inside this pedal is for the quality and the workmanship as much as anything. And it's there in buckets. And it does not actually look like it has been 'flow soldered' on the board (but I did not pull it further to check that). 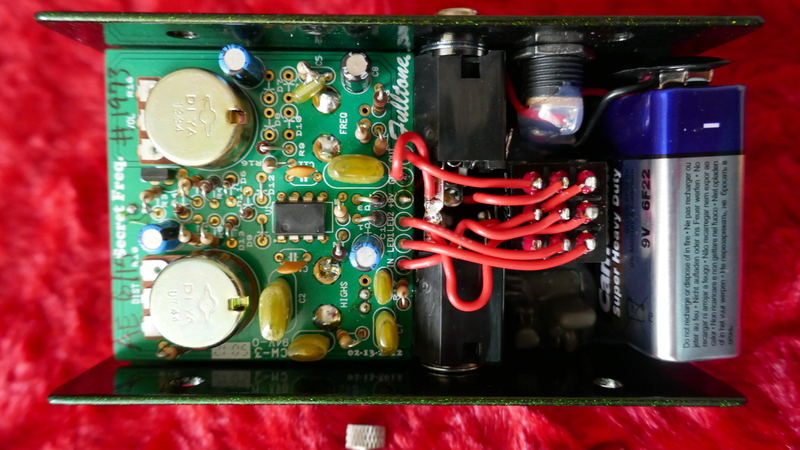 In any case, as you see the board is well made in 2015 and is number #1973 (but the actual board was made in week 50 of 2012) so Fulltone do appear to lke what they do and 'bother' to put the effort in throughout the build of the secret freq pedal. Nice. 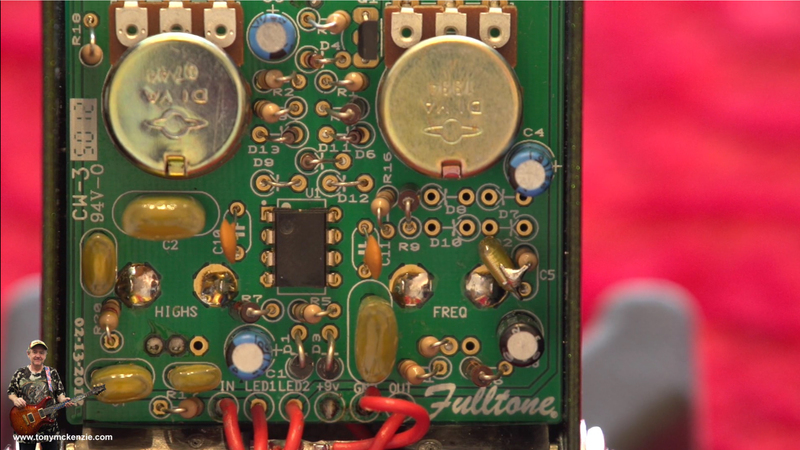 So the Fulltone distortion pedal passes on the quality side of things admirably but do note that on this USA version there were no CE or RoHS compliance markings, but the country of origin was on the case. It all sounds a bit weird... calling the pedal a 'secret freq', but the real secrets right there in the name... this pedal can be set to boost (or not) the frequencies in the 'mid range' and as many guys will know, that is the generally accepted area of the frequency range that defines the sounds of your guitar... try it out some time with a wah pedal! This unit can also use 9 to 18 volts DC for input and 18v will have an effect (usually) of making the headroom a little better often. So what we have here is an overdrive or distortion pedal (that has some bark) and a mid range boost... oh there's also a top end knob on there too to carefully adjust your top end of the output for the finer things in tone. The thing is, that freq knob does not really 'take away' from the bottom end, which stays there throughout and adjuctments... it's those mid ranges that you are tweaking. This unit can be adjusted on the drive and volume to meet the requirements from a simple clean(ish) tone right through to metal tones and anything in between which makes it a pretty useable pedal all around. In fact this pedal has variable gain up to 20Db increase of the mid boost and from using pedals with up to 25Db that's a pretty big upscale. But that 'secret freq' adjuster really IS the secret to this pedal. I bought it on the basis that it would somehow emulate a wah in circuit set at a particular frequency (rather like Michael Shenker used to) so I bought it, but there is more to this pedal than even that use. Because you can still add that sparkle with the top end control then you can be in to different territory. I could sit here and write more intensely about technical aspects of this pedal but hey who cares - does it sound good or not! But we'll come to that later. But theres also another use for this pedal which most (well at least some of us) might not have considered. It's possible these days in a mix to see where competing instruments in a mix are competing exactly (using iZotope Neutron for example) and then being able to slightly 'tune' that frequency so there is less confliction. Of course you could later EQ the sounds, but by careful checking BEFORE you record anything then those problems will be less prelevent. The freq nob could allow you to do that... that is, if you go to those extremes. Me? I just plug it in, adjust until it sounds 'right' and record. On my video below I run through this pedal (inside and out) and actually play with the secret freq towards the end of the video if you want to hear what this pedal is really like. In reality I bought this pedal to mimic Shenker but then found even more reasons to like the secret freq. Often on overdrive and distortion pedals it's usually very much of the same stuff no matter what those makers say... it's one reason why I don't have twenty or thirty overdrive or distortion pedals in the first place... but there ARE guys out there that really do! Who knows why except maybe they just wanted to burn money or be in a 'look at my pedal board' syndrome. But any 'reasonable' guy may have just a couple or so... actually I have 4 such pedals (but two of them are the same so don't count!). The secret freq's advantage though is NOT just as a distortion pedal, but more of a unique pedal to offer you tones that other similarly typed pedals cannot hope to achieve. So in a way I had my cake and ate it too! And where that USA quality is concerned this pedal absolutely has it. 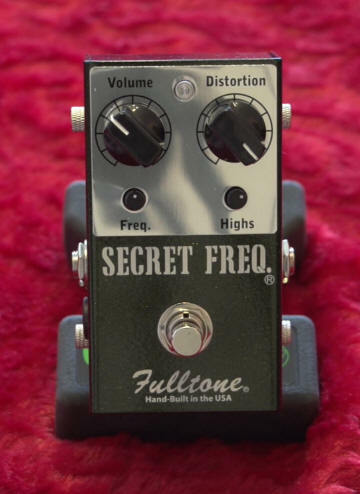 If you are in the market for a distortion pedal that has a wide range, but also can do other stuff that most of them cannot then the Fulltone secret freq pedal could well be for you. A good indication of pedals for me is whether I still have it some time after the review... often I sell them. 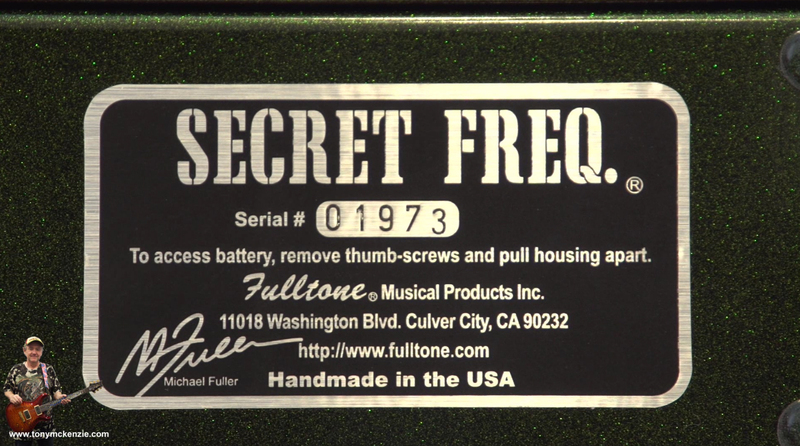 But in the case of the Fulltone secret freq I still have it longer than a year so that for me is the clincher - my actions often do speak louder than words and this one is still here. My advice is to try it out before you buy it and preferably with similar or the same gear you use then there are no disappointments later down the line. Even at the retail price it's worth the money as often this brand is. Try one!